I'm very excited to announce that a much requested and waited for feature is here: the Google Calendar integration. 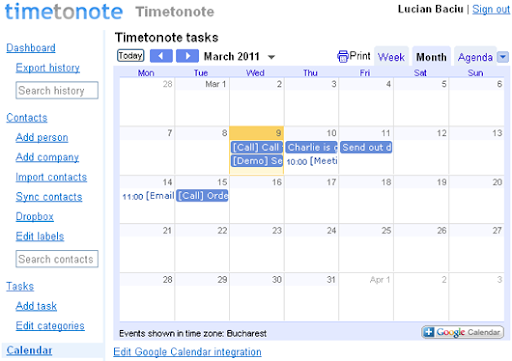 This new feature will enable Timetonote users to view their Timetonote tasks on a Google Calendar. After you've set up the Google Calendar integration, all your upcoming tasks will show up on your Google Calendar. When you add a new task, edit, delete or complete a task the action will be reflected on your Google Calendar in seconds. Thus, your Google Calendar will always by in sync with your Timetonote tasks. However, this is a one way sync so changes in Google Calendar will not be reflected back in Timetonote. Other great benefits that come with the Google Calendar integration are, among others, Google notifications for the upcoming tasks on the Google Calendar, the option to print a Google Calendar, and to view your Google Calendar on mobile devices. You'll have to go to your Google Apps "Domain management" page. Then click on "Grant data access" to grant Timetonote access to the new data requirements. This will enable all your domain users that use Timetonote access to their Google Calendars. Click on the new "Calendar" link in the left navigation sidebar. Click on "Edit Google Calendar integration". Then click on "Change Google account", this should open a new browser window (check if your browser is blocking popups if you don't see it) and follow the steps to authenticate and grant Timetonote access to your Google Calendars. Login to Timetnote, click on the new "Calendar" link in the left navigation sidebar. Click on "Save changes". Any existing existing upcoming tasks you have in Timetonote will be added to your Google Calendar within the next few seconds. You can now start adding new tasks in Timetonote, editing or deleting them and the changes will be reflected on your Google Calendar. When you complete a task in Timetonote the corresponding Google Calendar event is deleted. The event created in Google Calendar for a task will have all the info associated with the task. All day tasks are created as all day events, the task category is added to the event title, and the contact or project the task is linked to is added to the event description. In order for times to show correctly between Timetonote and Google Calendar you must ensure the timezone is set correctly in Timetonote. To change your Timetonote timezone click on "Settings". If you like this feature and if you like Timetonote, please support Timetonote and write a few words on the Google Apps Marketplace. Thank you for using Timetonote, I hope you like this new feature. Lucian, great work with TTN. Would it be possible to have TTN Tasks 2 way sync with Google Apps Task list instead of the primary calendar? Even better, I use Things and iCal. Integration of projects and tasks there would be excellent. Unfortunately, Google Tasks does not have an API yet, to sync with. Think google tasks have that now. I'm using manymoon at the moment, and it syncs both ways. I agree, two way sync would be great. This is on the to do list for Timetonote. Thank you for your suggestion.